Air-Vac's Multi-Stage UV Series provides near perfect vacuum of 29.7"Hg. Used to evacuate chambers, degas liquids and in other processes requiring vacuum levels of 1/4"Hg absolute (8Torr). Also used as the first stage pump in applications requiring high vacuum to reduce operating time of expensive high vacuum pumping systems.Increase pumping speed above 25"Hg vacuum level. 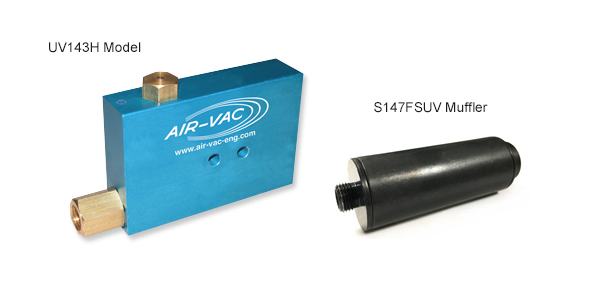 • The UV143H uses two venturies acting in tandem to generate very deep levels of vacuum. • Compressed air flows into the two venturies. 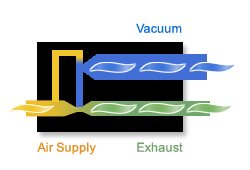 • The exhaust from the smaller one is directed into the vacuum chamber of the larger venturi, which directs the entire flow of air into the atmosphere. • Since the smaller venturi exhausts into a pressure chamber that is lower than atmospheric, it can attain a vacuum level down to 29.7"Hg - a vacuum level not attainable by a conventional single stage vacuum generator. We Build Custom Vacuum Generators to Your Specs! Integral part of your product!